2.5 stars. Just so you know...yes, I was screaming inside of my own head. The caps were indeed justified in this case.Thoughts when I saw this book sitting on a thrift store shelf :Oooohhhh...lookie...awesome cover girl with creepy black eyes. The title makes me want to know what's going on. 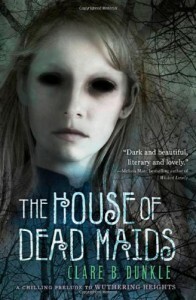 IT'S A HOUSE OF DEAD MAIDS - HOW AWESOME!Thoughts when I read the back cover :OH HECK YEAH. It's a Wuthering Heights prequel in YA form. WITH LOTS OF GHOST ACTION!! !Me after reading the book :Sigh. At least I paid less than a buck for it. Talk about just missing the mark...In all fairness, I think House of Dead Maids was intended for the pre-teen crowd, which might be why it really didn't work for me. I probably would have enjoyed this book at around age 12, especially before I knew anything about who Heathcliff was. The illustrations at the beginning of each chapter were creepy in an extremely cool way. The ghosts were not scary to me at all as an adult, but the style of writing would have given me a little bit of a chill back when I was still trying to sneak Christopher Pike books under the covers. Does the story feel like a possible prequel to Wuthering Heights? Honestly...I didn't think so. But again, this book will work for younger readers who aren't looking to compare the two. It's possible that this book would get them interested in trying out the classic inspiration in the future. I (almost) feel guilty giving the book such a low rating when I know if I had done my homework and read some other reviews, I probably never would have picked up the book to begin with. Go, go cheapie impulse purchases! At least the book was extremely short (also in line with the length of a children's or middle grade read), so I was able to breeze through most of it fairly quickly, along with skimming some of the pages where the descriptiveness bordered on awkward. I'd only recommend the book to pre-teens who are looking for a creepy little ghost story. Anyone much older than that probably won't be as impressed.